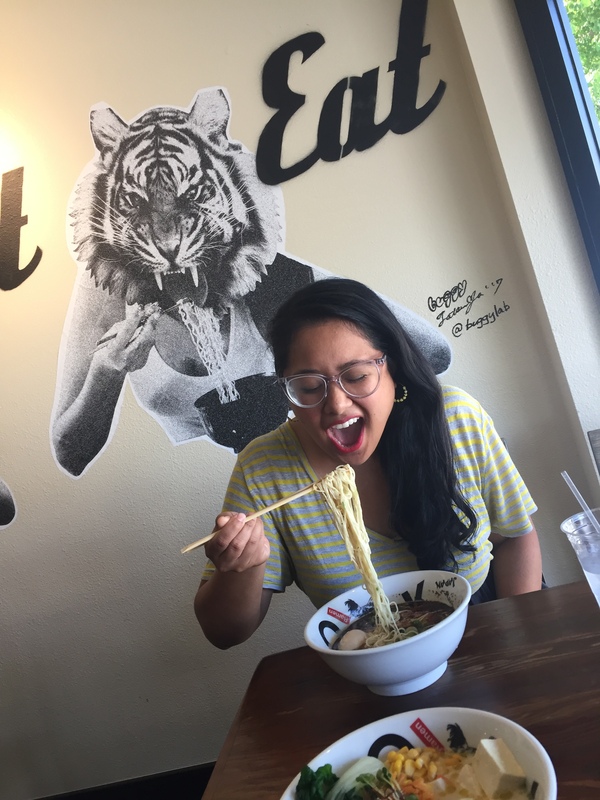 Lately I’ve been playing some morning gigs out in North Hollywood area and would sometimes have a little ramen run afterwards. Either solo or with a buddy. This time I was joined by Kateri. We found a place called Yok Ramen in Sherman Oaks, along Ventura Blvd. where you can find other ramen joints along the street. My Deluxe Veggie Ramen’s broth was made with canola oil, onion and cabbage. So it had a very subtle, delicate flavor. The toppings were green onion, corn, carrot, daikon sprouts, chili pepper threads and yuzu flavored olive oil. I have to say that my ramen broth was really different. It tasted citrusy and tangy, probably because of the tangy daikon flavor and yuzu olive oil (yuzu is a Japanese citrus fruit.) I am not sure if I dig the citrusy broth. The noodles were good and for the most part, I liked the combination of toppings. The restaurant had a really fun hip vibe, with the artwork all over the restaurant. Since it was a late lunch on a Sunday and they were about to close for their afternoon break, we were the only ones in the restaurant. Our server looked like a perfectly cute J-pop singer. Would I go back here? Probably not. It wasn’t that the ramen was terrible, but it just wasn’t my cup of tea. But I liked that everything in our bowls looked fresh. Kateri seemed to like hers so it’s all good. Street parking can be found on Ventura Blvd. and the surrounding neighborhoods.